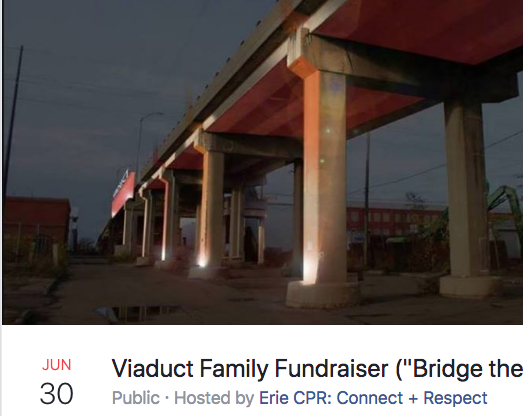 Viaduct Family Fundraiser: Saturday, June 30, 11AM — Why Save the Viaduct? To Keep Kids Safe. Meet at 12th and East Ave. at the St. Nicholas Parking Lot on Saturday, 11am - 1pm. Refreshments, kid-centered-fun and a Viaduct self-tour map will be offered during this 2-hour informational, interactive fundraiser. A printed, self-guided #ErieViaduct tour and orange wristband will be available for a donation. Funds collected will be deposited with the non-profit Erie Winds of Change (the 501c3 that is serving as fiscal agent for ErieCPR) to help cover the costs of gaining a Public Hearing and saving the Viaduct. In addition to the Erie Chapter of the NAACP, the African-American Concerned Clergy of Erie have joined ErieCPR’s call for a demolition delay and Public Hearing. Early this year a New York Times reporter visited Erie and spoke with ErieCPR members as well as with Mayor Schember, his staff and with one of the Mayor’s key Transition Team Advisors. The New York Times quoted Mayor Schember’s Advisor’s support for demolition of the Viaduct and his comment that the Eastside was filled with “failing neighborhoods” with no one he would want to live next to. This Advisor’s views apparently guided the Mayor’s reversal of his previous statement that he would not to object to a Public Hearing. Contrary to misinformation from City Hall, there has never been a Public Hearing, the money is available to repair the bridge and the maintenance cost would be obtained by a non-profit organization under a P3 agreement with the City similar to the one currently used for Frontier Park (L.E.A.F. ).